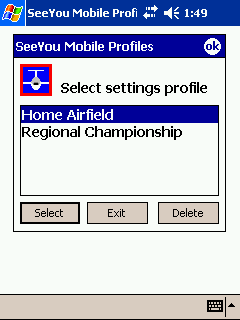 SeeYou Mobile helped win World Championships numerous times already. It is a complete and reliable in-flight navigation software for beginners and champions alike. Designed for PDA and PNA devices with Windows Mobile or Windows CE operating system. SeeYou Mobile comes pre-loaded on Oudie 2 stand alone navigation device from Naviter. It integrates beautifully with SeeYou on the PC. SeeYou Mobile is a stand alone application which helps glider pilots at all levels better understand soaring while it is happening. The two Map pages in SeeYou Mobile can be set up separately. You may want to use one for general navigation while the other Map page can be used for the details. Switching between the two is simple, just a click on the navigation buttons. A click on the map will bring up the Goto dialog where you can select which point you are navigating to, you can see the Airspace info and manipulate the Task. A tap on the Wind vector, the North arrow or Final glide indicator will open a dialog where you can control features of this element. A tap on any symbol, including the Glider symbol and Navboxes, will let you freely move them around the screen. Since version 2.1 a high contrast color scheme is available to make the otherwise dull Pocket PC screen much brighter. The map page is the one you will use most often in the air. It’s worth studying its options to use all of the features it has to offer. Statistics in flight provide insight to the soaring day in real-time. SeeYou users are already used to analyzing their soaring performance by studying the average lift achieved on task, inter-thermal speeds and cross country average speeds. How about having all this data available in real-time? The Statistics page is divided into two panes. First pane shows the averages of the last four thermals. The large number on the right is the average of these four thermals. Want to use this as your McCready setting? Look at the weather ahead of you to decide. Statistics page is one of four main pages in SeeYou Mobile. It can be accessed by using the navigation buttons left and right. With the airspace getting smaller and smaller for glider pilots, keeping out of forbidden areas is imperative. SeeYou Mobile offers you touch-screen, visual and audio control about the airspace in your vicinity. First level warning triggers three beeps. In addition to that, the airspace in question is marked bold red, filled transparently and a red banner appears on top of the page. Just like the picure on the left. 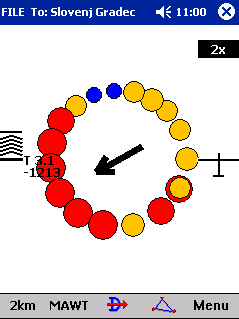 Second level warning triggers a full screen Alarm with continous audio alarm. To quit the alarm you have to dismiss the warning for either 5 minutes, an hour or Today, if the warning was false. See picture at the bottom. If you just want information about what is ahead of you, Tap on the screen to receive Cursor information on the airspace at the location of the tap. In this view, a particular airspace can be dismissed for today or always. Creating or modifying the task is simple with SeeYou Mobile. You can do it either at the briefing, before takeoff or in the cockpit. A single click will upload it to the supported GPS device. Use the Menu > Task dialog. 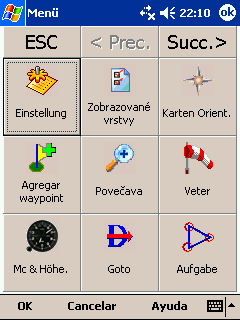 Through the Menu > Task dialog, a task can be input manually using the PocketPC keyboard. Use the Navigation buttons to insert and edit Task waypoints and its observation zones. Observation zones are setup in the same way as in SeeYou.Complete support is available for flying for badges and records. Just as well as flying the ever more popular Area tasks in competition.Pressing the “Declaration” button will upload the task declaration to your logger. 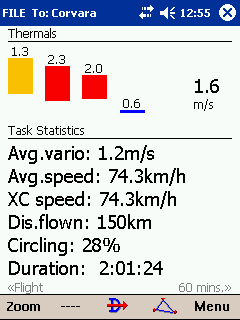 No need to change cables or waypoints in the GPS!In addition to flying the task graphically, the Statistics page has more information about how you are doing on the task. Now you know how many kilometers you have already completed. SeeYou Mobile tracks kilometers in real-time. 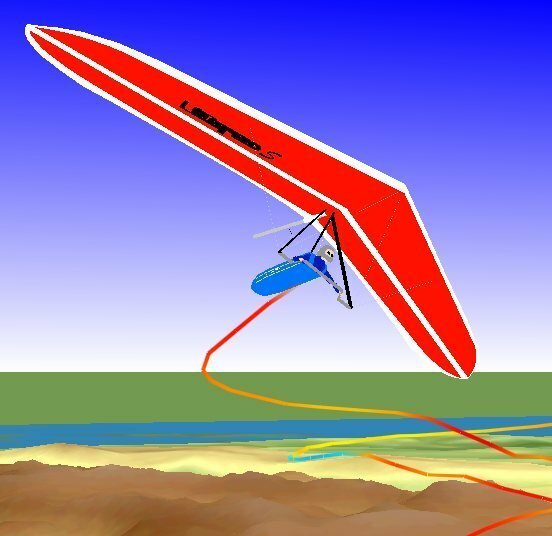 Separate optimizations are available for the Online Contest rules, Free flight with three turn points and FAI Triangle. It is designed to assist you with finding the core of a thermal. However – we were not trying to develop a Wizard, just an Assistant. It is intended for the times when you are tired or have better things to do than focus 100% on the thermal. It will only sound a bell if the vario varies significantly in strength. FAI Triangle Assistant will simply follow what you are doing. As you fly the first leg it won’t yet know which way you are going to fly. The FAI Area will be drawn on one side of the first leg. If you would like it to be on the other side, simply tap inside the area and it will rotate to the other side of the first leg. On the second leg: As soon as the triangle you have flown is deep enough the FAI Area changes. It is drawn on the last leg you have flown. That means it is showing you the way towards the area where you will be able to turn your second waypoint and allow your whole flight to be an FAI triangle. After you have turned your other waypoint, it’s just about returning home. The FAI Triangle assistant has done its job. The above example focused on an FAI Triangle which has been started from one of its corners. Flying a triangle with the start on the leg is no different, just the sequence of the legs changes. Profiles enable you to use SeeYou Mobile in several locations and different gliders without having to change settings all the time. 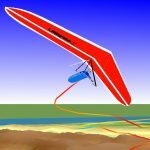 If you fly several types of gliders or fly at different locations you are likely to be fed up with changing the polar, terrain, waypoint and airspace files each time before the flight. Profiles were introduced in SeeYou Mobile 2.0. You can have separate setups for each of your club’s gliders plus a profile for the competition you are attending shortly. Copy current or create a new profile in Menu > Settings > Micellaneous. Next time you start SeeYou Mobile you will have two profiles to choose from. You may have as many profiles available as you wish. Flarm is sort of a collision avoidance device. 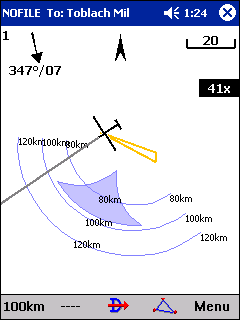 It warns pilots about the proximity of another glider carrying a Flarm device. SeeYou Mobile reads the proprietary NMEA sentences from Flarm and issues a visual and audio alarm when another glider or obstacle is on a collision course. We sincerely hope that this breakthrough implementation of voice warnings will help us all enjoy gliding even more in crowded airspaces round the World. In order to be able to see these warnings you need to use Flarm as GPS input to your SeeYou Mobile. The Team feature in SeeYou Mobile will help you find or hide your teammate. Team function lets you share your position with other pilots and even encrypt this information so that your competitors won’t be able to decode it.
. Enable the “Team Position Code (Team)” Navbox in Menu > Next > Navboxes.
. Go to the map view and tap on the Team navbox.
. Team dialog opens. You need to press Setup before first use. SeeYou Mobile speaks your language. To have the opportunity to select from several languages you must download the [multilingual version] of SeeYou Mobile. If your language is not supported and you feel you can do the translations, please write toinfo@naviter.si. We will be happy to provide the tools with which you can do the translations! There is a number of people who deserve a warm thank you for contributing to SeeYou Mobile in a most valuable way. Setting up SeeYou Mobile to meet your requirements is easy, yet versatile. The Settings dialog will let you control how the application will respond to your actions. 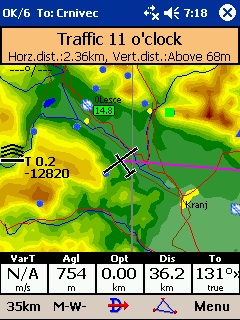 Setup the look and feel of the Map view, Airspace, Waypoints, Navboxes, glider Polar, Units, fonts, Pocket PC button actions and more through a single and clear Settings dialog. We suggest you browse through the Menu > Settings at least once after you have installed SeeYou Mobile. It will give you a general overview of what is available. SeeYou Mobile connects perfectly to the desktop version of SeeYou through a very simple connection wizard. 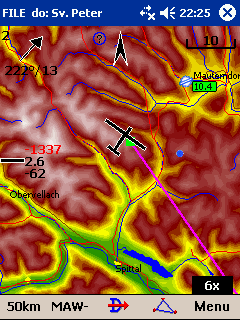 This way you can transfer Terrain maps, Waypoints, Tasks, Airspace and Settings through a graphical interface. First page allows you to select the Items you wish to transfer to the device. 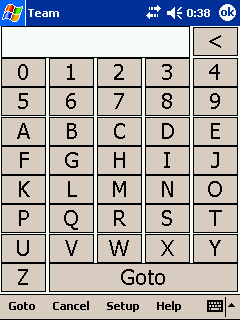 Second page gives you the possibility to select basename and destination folder for the data. Third page asks you to draw a rectangle for the area you want to transfer to the Pocket PC. Fourth page shows progress in transferring or saving files.